If you’re looking for a laid-back destination that’s still filled with lots to see and do, Brighton is a great place spend a few days exploring. Located only about one hour from London, Brighton is easy to get to, making it perfect even if you can only come for a weekend escape. From beaches and bike trails, to nearby villages and quaint neighbourhoods overflowing with cafés and independent boutiques, Brighton offers a lot to see and do no matter what you’re in the mood for. Read on for five things to do in Brighton that will help you discover this charming seaside town like a local. Brighton has stunning architecture, from the regency era to the 21st century, all of which looks even more amazing from the sea. There’s also a calmness to being on the water, especially when the clubs and bars are in full swing during the summer months and you need a respite from all the activity. Head to Brighton Marina (take the bus from the centre of town, or walk 25 minutes from Brighton Pier) and take a boat tour. There are several companies offering boat trips that usually last between 45 minutes and an hour. Feeling a bit more energetic? Rent a kayak or paddleboard and paddle out into the sea yourself. Need some greenery in your life? Then visit Devils Dyke. Part of the South Downs National Park, the beautiful spot is a natural valley that is full of myth and legend. The views are incredible, and on a clear day you can see 50 miles away in all directions, including the Isle of Wight. Devils Dyke is also home to paragliding clubs, and gliders will often take off and land next to you whilst you’re enjoying a cold drink or an ice cream. Want to spend a bit more time in the countryside? Take a walk down to Fulking Village or Saddlescombe Farm and then trek back up. The village of Fulking has some very popular pubs serving homemade food. If you just fancy a loop around the Dyke rather than trekking further afield, then the Devils Dyke Pub will look after you. The Undercliff will immediately have you believing you’ve been transported to a Greek island. White cliff faces meet turquoise blue seas that at low tide reveal miles of rock pools that are great for children to play in. A wonderful little café sits in the foot of the cliffs at Ovingdean that has wonderful homemade cakes. Carry on a bit further and you’ll reach historic Rottingdean Village, former home to the author Rudyard Kipling. The White Horse allows you to get a pub lunch overlooking the sea, or head up the narrow village street for a cream tea. At the end of the Undercliff lies Saltdean and its 1930s art deco lido. Head through the tunnel at the end to find the lido, which has just undergone a massive refurbishment and is home to a 40-metre swimming pool. This is a good spot for people who like swimming but don’t want to venture into the sea. It also has a children’s swimming area. When the weather is good and games are scheduled, taking in a cricket match with a cold drink in hand is the quintessential English thing to do. And if you time it right, it’s free! The Hove County ground, home of Sussex CCC, is about a 30 minute walk from Brighton City Centre or 10 minutes on a bus, and can provide a tranquil green oasis on a busy summer day. The peculiarities of cricket mean they stop for lunch and tea, and after tea on championship games you can gain entry for free. Whether you get anywhere near understanding the game doesn’t matter; all you really need to know is that it’s a sporting event with a glass of Pimm’s or a cold beer in the sunshine — what could be better? Sussex is the oldest of the professional county teams and has had some of the best players in the world play for them over the years. Come to Brighton in May, it’s Brighton Festival time! Every year for one month Brighton Festival takes over the city. The multifaceted arts festival is comprised of everything from dance and literature, to music, theatre, and comedy. There are acts from all kinds of performers so keep your wits about you because everywhere you turn there may be a performance taking place. Art on the beach, music in parks, comedy in theatres – all performed by people from all over the world. The festival starts with the Children’s Parade, with local schools all getting involved and creating costumes and floats on a particular theme. Then you have your pick of performances. In addition to the Brighton Festival, Brighton Fringe and The Great Escape music festival are also running, making May an ideal time to visit for a dose of arts and culture. 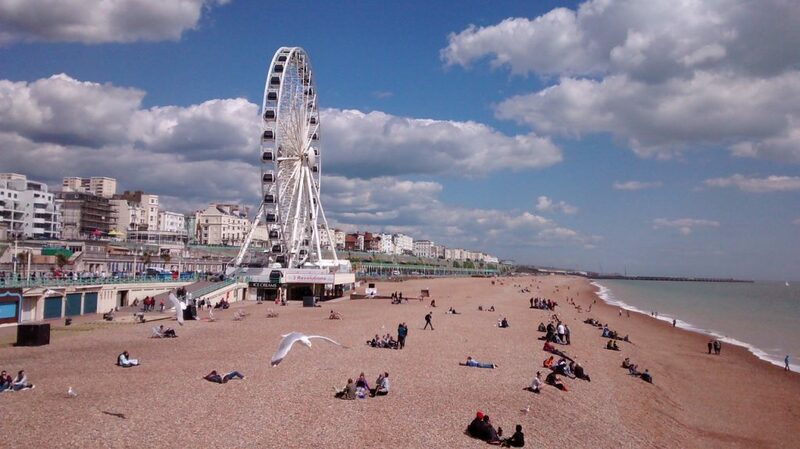 Brighton is the eccentric grand dame of British seaside resorts. Boasting a stunning Edwardian pleasure palace, kitschy amusement arcades, awesome independent shopping, and a vibrant night scene, this ultra-bohemian bastion on the beach has got it covered when it comes to Cool Britannia by the sea.